It might sound little crazy when someone talks about visiting the hottest belt of India –Nagpur-Chandrapur in Maharashtra – in scorching summers of 42+ temperature in the month of May with entire family, but all the wild life lovers are bit crazy and they enjoy this craziness because that is their professional requirement as well. We boarded the Bilaspur Rajdhani Express in the afternoon of 19th May and reached Nagpur at 0930 hours on the following day, 20th May. After having lunch at Chandrapur, we reached Kolsa Forest Rest House by 15.30 hours and immediately started the afternoon safari at 1600 hours while the temperature was giving us a feeling as if we were in an oven. We were fortunate enough to see a male Tiger cub and a female cub in the Shivanjhari area in Kolsa range. The excitement of my daughter Nitya and grandson Ayaan were palpable because this was their first ever safari at TATR and they could see a Tigress at a close distance of 25 feet. In the last decade, I have visited almost all the wildlife parks in North & central India, where Sloth Bears are usually seen in the early morning or late evening, But Tadoba has the distinction of Sloth Bear sightings throughout the day. During one safari, we were lucky to see one, as soon as it came out of the water after shower. We could clearly see water dripping out of shining black natural coat. One of the days, while coming back from the afternoon Safari from Katejhari to Tadoba Lake, we heard a loud Cheetal (Spotted Deer) call, which usually denotes presence of a big cat. However, we were delighted to see a crocodile walking on the banks of the lake being curiously watched by Cheetals. We also saw a small creature similar to a squirrel, known as Tree Shrew, mammals native of the tropical forests of South East Asia, in the Tadoba range near the Crocodile Breeding Centre. Tree Shrew have a higher brain to body ratio than any other mammals including humans. This was my first sighting of a Tree Shrew at Tadoba. Tadoba is a heaven for birds too. 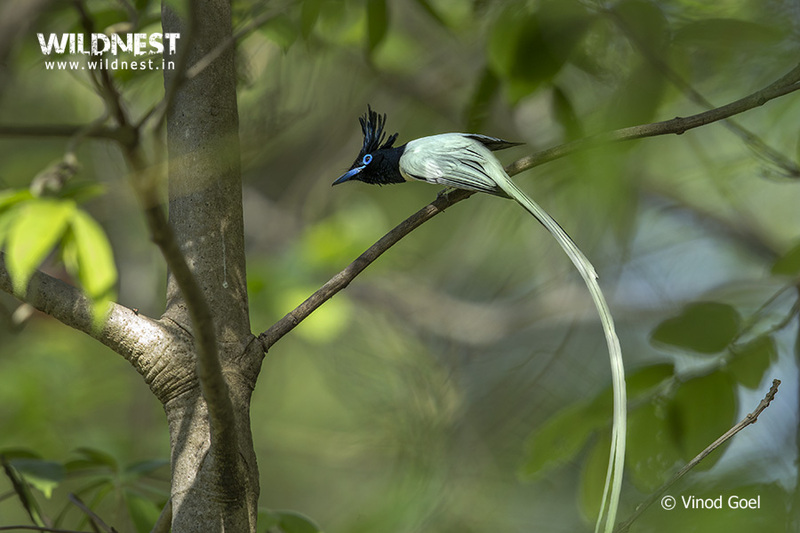 Numerous birds, such as, Indian Pitta, Asian Paradise Flycatcher, Lesser Racket-Tailed Drongo etc are found here. However Grey Junglefowl is seen only in this national park in the North or Central India. Seeing 12 different Tigers in a short span of just 6 days is remarkable even for a wildlife lover, and for a family this number is something out of the blue moon. What really made this trip special was apart from Tigers, we saw a pack of 3 wild Dogs, 2 Sloth Bears, Chousingha (a Four-horned Antelope), Crocodiles,Tree shrew and lots of birds making it a complete experience.